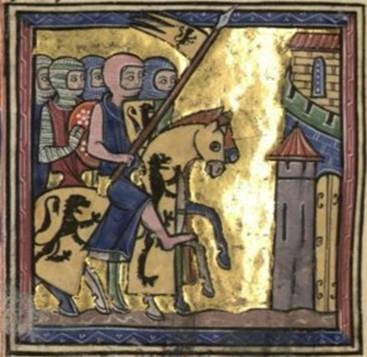 Histoire d'Outremer, Saint-Jean-d'Acre, Latin Kingdom of Jerusalem, late 13th century. 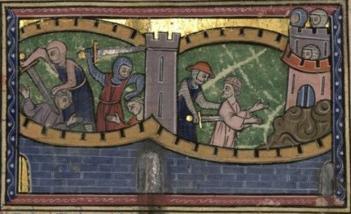 Bibliothèque nationale de France, Manuscript: Français 9084. 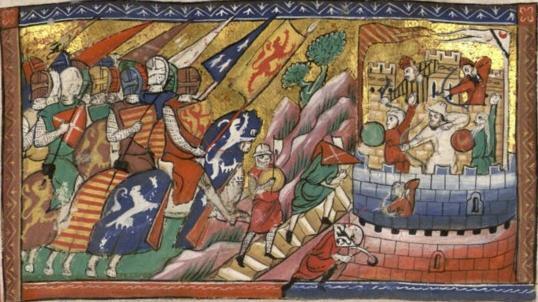 A - Crusaders massacre Muslims of Antioch, f.64; B - Bohemond and Raymond before Jerusalem, f.307v; C - Crusaders besiege Shayzar, f.182v; D - Siege of Tyre; E - Siege of Antioch; F - Siege of Damietta. 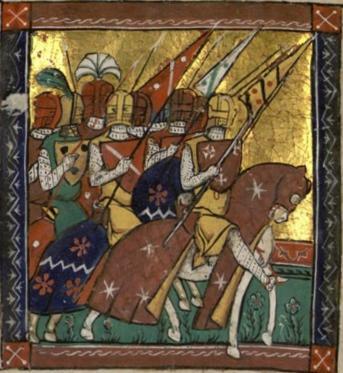 In another manuscript made by the school of Acre, Crusaders are clearly and quite deliberately shown with round (C) or oval (B) shields. This seems to indicate that, far from the Muslims adopting some of the supposedly more advanced military technology of the West, the reverse might have been happening to a limited degree in response to specific military circumstances. 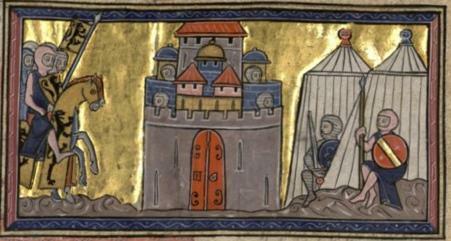 The Crusader States were by now little more than a string of castle-bound garrisons. Ventures into open battle were rare and usually disastrous. Any local military fashions that distinguished the troops of the Crusader States from those of Western Europe are, therefore, likely to reflect purely defensive warfare of ambush and siege. One warrior has a brimmed chapel-de-fer war-hat (A) which is of almost exactly the same size and form as the supposed sun-hat in the previous manuscript. Muslims are accurately portrayed with turbans (D and E), maces (E), and small round shields (D and E). 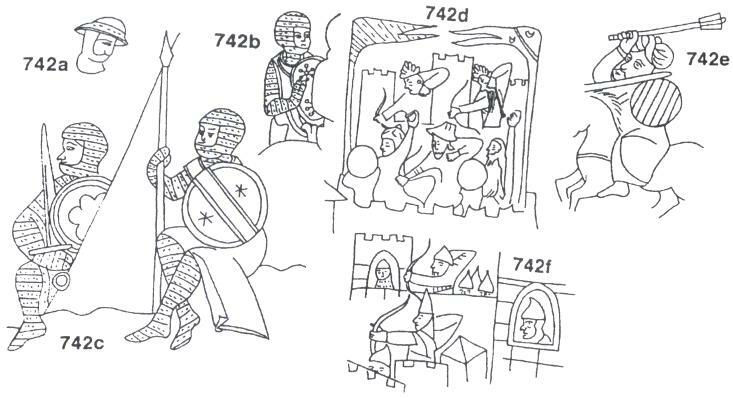 One archer has a hat or an iron war-hat with a square top (D), while others have pointed helmets, tall, short or with angled crowns (F), as well as mail and perhaps in one instance lamellar armour (F).